The Old English Latin alphabet—though it had no standard orthography—generally consisted of 24 letters, and was used for writing Old English from the 9th to the 12th centuries. Of these letters, 20 were directly adopted from the Latin alphabet, two were modified Latin letters (Æ, Ð), and two developed from the runic alphabet (Ƿ, Þ). The letters K, Q and Z were not in the spelling of native English words. 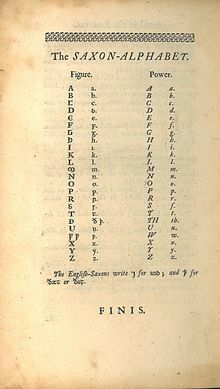 A table entitled "The Saxon-Alphabet" on the last page of John Fortescue's The Difference between an Absolute and Limited Monarchy (1st ed., 1714) The first column ("Figure") of the table shows the letters of the Old English Latin alphabet, and the second column ("Power") their modern equivalents. Old English was first written in runes (futhorc) but shifted to a (minuscule) half-uncial script of the Latin alphabet introduced by Irish Christian missionaries from around the 9th century. The Latin spellings include some conventions associated with the Italian alphabet, such as hard vs. soft c, g, and sc. This was replaced by insular script, a cursive and pointed version of the half-uncial script. This was used until the end of the 12th century when continental Carolingian minuscule (also known as Caroline) replaced the insular. The letter ðæt ⟨ð⟩ (called eth or edh in modern English) was an alteration of Latin ⟨d⟩, and the runic letters thorn ⟨þ⟩ and wynn ⟨ƿ⟩ are borrowings from futhorc. Also used was a symbol for the conjunction and, a character similar to the number seven (⟨⁊⟩, called a Tironian et or ond), and a symbol for the relative pronoun þæt, a thorn with a crossbar through the ascender (⟨ꝥ⟩). Macrons ⟨¯⟩ over vowels were rarely used to indicate long vowels. Also used occasionally were abbreviations for following ms or ns. A number of changes are traditionally made in published modern editions of the original Old English manuscripts. Some of these conventions include the introduction of punctuation and the substitutions of symbols. The symbols ⟨e⟩, ⟨f⟩, ⟨g⟩, ⟨r⟩, ⟨s⟩ are used in modern editions, although their shapes in the insular script are considerably different. The long s ⟨ſ⟩ is replaced by its modern counterpart ⟨s⟩. Insular g ⟨ᵹ⟩ is usually replaced by its modern counterpart ⟨g⟩ (which is ultimately a Carolingian symbol). The /w/ phoneme was occasionally spelled ⟨uu⟩ in Old English manuscripts, but ƿ was more common. The consistent use of w developed in the early Middle English period, during the 12th to 13th centuries. Additionally, modern manuscripts often distinguish between a velar and palatal ⟨c⟩ and ⟨g⟩ with diacritic dots above the putative palatals: ⟨ċ⟩, ⟨ġ⟩ (cf. the Maltese alphabet). The wynn symbol ⟨ƿ⟩ is usually replaced by ⟨w⟩. Many scholarly works use only ⟨þ⟩ and not ⟨ð⟩ (the sounds were allophones in Old English and the symbols were used somewhat interchangeably). Macrons ⟨ˉ⟩ are usually found in modern editions to indicate putative long vowels, while they are usually lacking in the originals. In older printed editions of Old English works, an acute accent mark was used to maintain cohesion between Old English and Old Norse printing. ^ John Fortescue (1714), The Difference between an Absolute and Limited Monarchy: As it More Particularly Regards the English Constitution. Being a Treatise Written by Sir John Fortescue, Kt. Lord Chief Justice, and Lord High Chancellor of England, under King Henry VI. Faithfully Transcribed from the MS. Copy in the Bodleian Library, and Collated with Three Other MSS. Publish'd with some Remarks by John Fortescue-Aland, of the Inner-Temple, Esq; F.R.S. (1st ed. ), London: John Fortescue Aland; printed by W[illiam] Bowyer in White-Fryars, for E. Parker at the Bible and Crown in Lombard-Street, and T. Ward in the Inner-Temple-Lane, OCLC 642421515 . "Old English / Anglo-Saxon (Englisc)". Omniglot. omniglot.com. Retrieved 17 July 2010.